BACKGROUND AND PURPOSE: The purpose of this study was to review the imaging findings of nasal septal abscess in 2 patients with immunosuppression. MATERIALS AND METHODS: Two patients with immunosuppression were identified as having a nasal septal abscess, and correlative CT imaging in both patients was evaluated. RESULTS: The characteristic radiographic appearance of a nasal septal abscess included a fluid collection with thin rim enhancement, located within the cartilaginous nasal septum. After CT examination, incision and drainage was performed in both patients, and appropriate antibiotic coverage was initiated. Clinical and imaging follow-up demonstrated no signs of residual infection. CONCLUSION: Nasal septal abscess has a characteristic appearance on CT examination. Prompt diagnosis and treatment, including incision and drainage and appropriate antibiotic coverage, are necessary to avoid serious complications. Serious complications may occur as a result of the nasal septal abscess, especially in patients with immunosuppression. The purpose of this study was to review the imaging findings of nasal septal abscess in 2 such patients to assist radiologists to identify this uncommon, but serious infection. Two patients were identified with imaging consistent with a nasal septal abscess. Both patients had immunosuppression and were undergoing chemotherapy. The diagnosis of nasal septal abscess was suspected clinically by history and physical examination. The initial imaging, which was performed less than 1 day before the incision and drainage, included a CT examination in both patients. In patient 1, a CT examination of the head and neck was performed. In patient 2, a CT examination of the head and neck was requested, as per the physician's note; however, a CT of the brain was inadvertently performed. Follow-up imaging also included CT imaging in both patients. Patient 1 was a 76-year-old man with acute myelogenous leukemia, which was diagnosed approximately 5 months before the development of the nasal septal abscess. He presented with a 3-week history of nasal stuffiness, difficulty with nasal breathing, headache, and facial pain. The patient's white blood cell count was 86.7 K/μL at presentation. Nasal soft tissue swelling was present on physical examination. Anterior rhinoscopy was performed, which demonstrated fluctuant enlargement of the nasal septum bilaterally, suggesting a septal abscess. Aspiration of both the right and left nasal septa was performed with an 18-gauge needle; 8 mL of purulent discharge was obtained on both sides. CT scanning of the maxillofacial region was performed on a GE scanner (LightSpeed; GE Healthcare, Milwaukee, Wis), after intravenous administration of contrast material. Patient 2 was a 17-year-old adolescent boy with a history of T-cell lymphoblastic lymphoma in complete remission. The patient was on chemotherapy consisting of modified hyper-CVAD (fractionated cyclophosphamide, vincristine, Adriamycin, and dexamethasone). The patient reported a recent history of minor nasal trauma and complained of frequent blowing of the nose secondary to allergic rhinitis, and nasal tenderness for the previous 2 to 3 days. On clinical examination, there was a mild amount of edema and erythema over the dorsum of the nose with mild tenderness and the presence of a saddle deformity. The white blood cell count was elevated to 13.1 K/UL. Fiberoptic examination of the nasal cavity was performed, which revealed no evidence of asymmetry, erythema, or nasal discharge. Septal abscess was suspected because of the saddle deformity and nasal tenderness. CT examination of the brain with contrast was performed on a GE scanner (GE Healthcare) after administration of intravenous contrast material the next day. In both patients, CT imaging revealed a fluid collection with thin rim enhancement, located within the cartilaginous nasal septum (Fig 1 and Fig 2A). The nasal septal abscess was not originally detected on the CT examination of the brain in patient 2; however, it was present in retrospect. There were no associated solid components with the abscesses. Patient 1 had swelling of the adjacent nasal soft tissues. There was no bony destruction or evidence of osteomyelitis involving the adjacent bony nasal septum in either patient. A 76-year-old man with acute myelogenous leukemia. CT imaging through the nasal cavity demonstrates a thin-walled, cystlike collection with peripheral enhancement involving the cartilaginous nasal septum (large arrow) consistent with a nasal abscess. There are no associated solid components. Note the swelling of the adjacent nasal soft tissues (small arrows). A 17-year-old adolescent boy with T-cell lymphoblastic lymphoma. A, CT imaging of the brain demonstrates a subtle hypoattenuation of the cartilaginous nasal septum (arrows), found clinically to represent a nasal septal abscess. B, Resolution of nasal septal abscess after treatment. After the CT examinations, an incision and drainage was performed on both patients. Collection of purulent material was sent to the laboratory for analysis and confirmed the diagnosis of an abscess. In patent 1, pathologic examination revealed evidence of acute inflammation and the presence of granulocytic sarcoma (chloroma). The patient was placed on Valacyclovir (Valtrex) and levofloxacin (Levaquin). Clinical and radiologic follow-up at approximately 2 months revealed no signs of residual infection. For patient 2, Gram stain and culture were performed, which identified the presence of Aspergillus flavus, which was treated with voriconazole. Clinical and radiologic follow-up at approximately 6 weeks revealed no signs of residual infection (Fig 2B). To our knowledge, no previous reports on the imaging appearance of nasal septal abscess in patients with immunosuppression have been published in the radiology literature. The imaging findings of nasal septal abscess, a thin-walled fluid collection with adjacent inflammatory change, are similar to those seen with abscesses located elsewhere within the body. 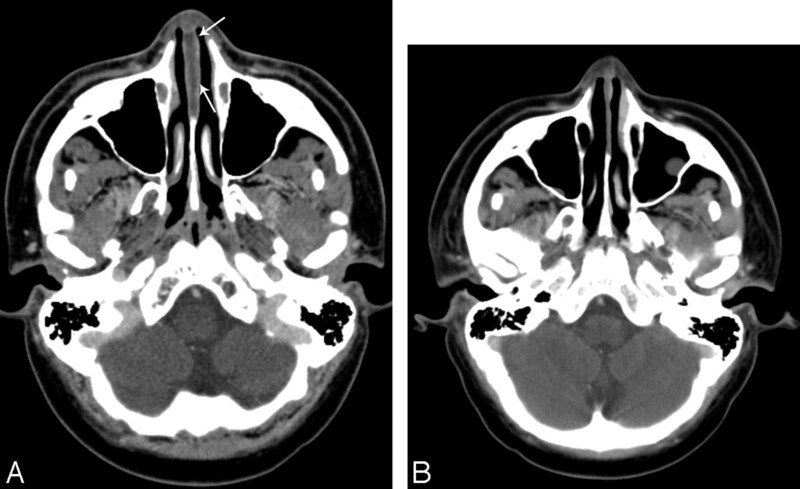 Pang et al3 reported a case of nasal septal abscess as an unusual complication of acute spheno-ethmoiditis with similar imaging findings of a thin-walled, enhancing fluid collection involving the cartilaginous and bony septum. 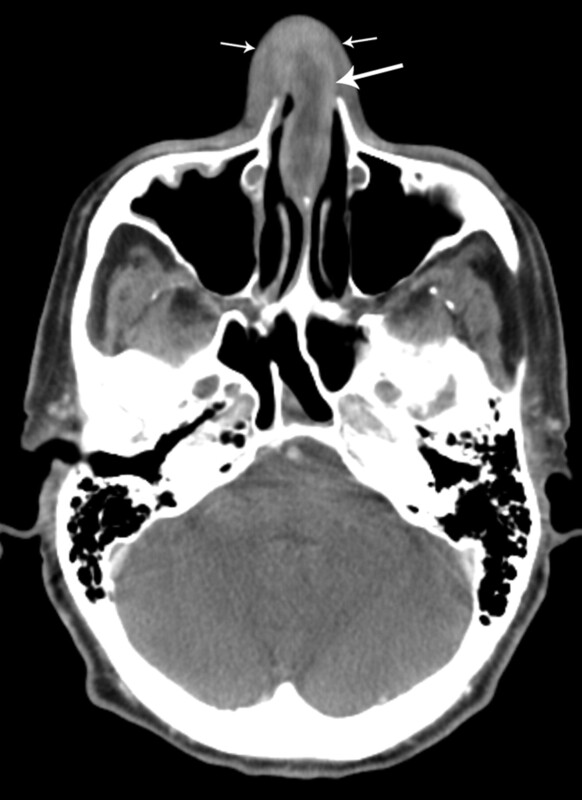 A nasal septal abscess has a characteristic appearance on CT examination as a cystic collection of fluid with thin rim enhancement involving the nasal septum. It is important for the radiologist to be aware of this rare infectious complication of nasal trauma and sinus infection, especially in patients with immunosuppression, not only to provide the correct diagnosis, but also to ensure immediate treatment to avoid life-threatening complications. Singh SK, Ginsberg, LE. The spectrum of nonnodal acute lymphocytic leukemia in the head and neck. Annual Meeting of the American Society of Neuroradiology; April 23–27,2001 , Boston, Mass. Accepted after revision April 16, 2007.